Cruise ship and airplane flyover traffic are on the rise throughout the Arctic. But what happens out there, thousands of kilometres from the nearest Canadian city, when something goes wrong? “As Canadians, we are subject to the tyranny of time and distance,” said Major-General William Seymour at a November senate hearing. He is one of the hands at the helm of the country’s search and rescue system, responsible for an 18-million-square-kilometre area of operation. Nowhere are the difficulties of time and distance more stark than in the North, with Canada’s least-travelled waters, its harshest and most unpredictable weather, and none of the port or road infrastructure that exists in the south. When someone’s in trouble in the dead of winter in Canada’s North, it truly becomes a race—over vast distances—against time. Two dramatic rescues off Baffin Island in recent years have demonstrated the difficulties presented by the Arctic. Last February, the fishing vessel F/V Saputi hit ice in the Davis Strait. A Hercules aircraft, sent from Greenwood, Nova Scotia, arrived to drop down by parachute four pumps, which the crew of 30 used to keep its beleaguered vessel afloat. Another Hercules, along with a Canadian Coast Guard icebreaker, monitored the vessel, which was listing hard to its portside, as it was escorted to Nuuk, Greenland by a Danish Navy ship. But a few months earlier, in September 2015, the Atlantic Charger sunk in Frobisher Bay and its nine-man crew endured 12 hours in a life raft, with chilling swells breaking over top of them. After one failed rescue attempt by a research ship, the crew was brought in two-at-a-time in a zodiac by another nearby ship. Though there was no loss of life, the Atlantic Charger’s captain was vocal about what he thought was a slow search and rescue response—Cormorant helicopters had been dispatched from Gander, Newfoundland, but before they got there the crew had already been picked up by the commercial ship. “Had there been a rescue station in either Goose Bay or Iqaluit, the rescue could have taken place a lot faster,” captain Byron Oxford, told The Globe and Mail. These two events have prompted renewed calls from local emergency response and industry officials to establish a permanent search and rescue base nearby, which would cut down the time it takes military sea or aircraft to reach distressed vessels in that area of the Canadian Arctic with the heaviest maritime traffic. The North’s immense size coupled with its relatively tiny population—the three territories account for nearly 40 percent of Canada’s landmass, but just over 0.3 percent of Canadians—represents a funding dilemma for defense budgets. Only six percent of all search and rescues occur in the North, says Toone. “As far as putting aircraft up North, the cost to actually create a base for a Cormorant—to be able to maintain the families, the crews, the maintenance—is enormous,” says Toone. 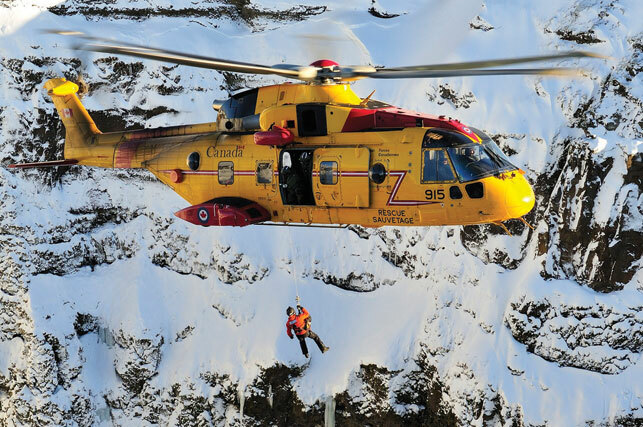 Instead, the search and rescue system depends on its local partners, like the Canadian Rangers and other mainly volunteer organizations and land experts. Jimmy Noble has been active with Iqaluit Search and Rescue for 25 years. These days, he’s one of two coordinators, which means he is a main point of contact during an operation. He helps organize and brief personnel and set up search grids. He doesn’t get to go out on searches that much anymore. “The majority of my stuff is office grunt work,” he says, with a hint of resigned acceptance. Yet for larger responses, like a ship in peril or a jet going down in the High Arctic, local volunteer organizations will have a role to play, but it will require heavy lifting by the military’s Cormorants and Hercules. Canada doesn’t have any year-round, dedicated search and rescue ships, planes or helicopters in the Arctic. Shipping traffic is projected to grow as ice cover lessens, and the polar route used by transcontinental jumbo jets saw a ten-fold increase in usage between 2003 and 2012. What happens when a catastrophe hits that needs urgent response? Without setting up Northern bases, Canada has instead continued to grow its system of systems. In 2011, it signed an agreement with Denmark, Finland, Iceland, Sweden, Norway, Russia and the United States to cooperate on search and rescue in the Arctic. And the military schedules regular training operations in Northern regions during historically busy times of the year. So if a call does come in, the training crew can jump into action to respond to the real thing. And Toone says a Cormorant, along with two flight crews and a maintenance crew, can be deployed to a specific area for weeks or a month at a time to anticipate higher-than-normal risks—like say, when a gigantic luxury cruise ship comes through the Arctic. So far, with trained personnel, a reliable network of local experts, and a dash of luck, search and rescue has managed to answer the call in the Arctic. But that major disaster, requiring the urgent rescue of hundreds of people in Canada’s most inhospitable clime, hasn’t happened yet. And we won’t know how well our system is prepared for that until it does.